HOT OFF THE PRESS!! EXPRESS EXPANDS IT DIGITAL PRINTING CAPABILITIES In our constant effort to stay at the leading edge of technology, Express Printing & Forms is proud to announce the newest addition to our production capabilities, the RICOH PRO C7110X Digital Production Color Document Solution. With the increased size capability of up to 13" x 27" sheets and additional 5TH COLOR CAPABILITY (CLEAR, WHITE, or NEON YELLOW) , this machine offers quick turn and fine quality reproduction for all your printing and copying needs. **SEND US YOUR FILES** Just click on the "SEND A FILE" Icon above and upload your files and get the quickest and finest reproduction available in our area. 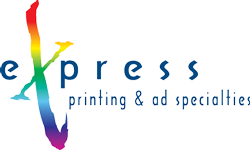 To learn more about Express Printing & Forms of Lafayette, browse through our Company Information section. An easy-to-use pulldown menu, search engine, and link to our contact form appear on each page. As well, feel free to consult the site map at any time if you're having trouble locating a particular item. If there's anything we can do to improve our site, please let us know. Enjoy your visit!